Chinese is not a huge milk consumer and yogurt does sound very odd for Chinese. 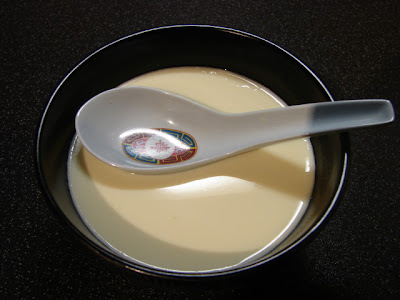 What I am talking here is ginger milk curd, a set yogurt or junket or tau fu far (Chinese soy milk curd) like sweet pudding very popular especially in Hong Kong or Canton in China. The making of this milk curd is nothing like yogurt or even junket. The setting agent is a secret ingredient - ginger. Ginger contains enzyme which will set milk at certain temperature. Not heard of this theory or practice in the western world but Chinese has been making this curd for years when fresh or long live milk was available mainly imported. I fell in love with this silky smooth pudding many years ago but never know how to make it. Excellent cure when you have a sore throat or cold, slips down nicely. Also great if you have gas problem or indigestion experience with dairy and like to take milk to increase your calcium intake. Many recipes out there are not that reliable, I had quite a few failures but have now sussed it. Some said 1 tsp of ginger juice per bowl which is not enough and some suggested a much lower temperature which will not work. Other has suggested pouring the milk from one pan to the another and back again, this is to cool the milk but I find this is not really necessary. This yogurt is suitable for vegetarians (if you take milk) or anyone who hates the slight sourness of yogurt and won’t use gelatine or rennet to set milk. The only thing is you got to love the flavour and spicyness of ginger. The ginger must be old, young ginger will not set the milk. Common ginger available in UK are old ginger so it is suitable. Here is my version of the recipe if you like to try. Most recipes out there only use semi skimmed or full cream milk without additional milk powder, the curd is very soft. I prefer to use full cream milk find it more silky and the additional milk powder makes the curd much thicker. You do need some sugar for this pudding, without sugar the taste of ginger can be a bit harsh. Grate the ginger and squeeze out as much juice as you can. Pass the juice through a fine sieve. You need 4 tbsp of yellowish cloudy juice. Boil the milk till warm then stir in the milk powder. Continue heating the milk till around 80 deg C, or when you start to see small bubbles appearing around the rim of the pan on the top of the milk. Turn off the heat and stir in the sugar. Now stir the ginger juice to make sure any sediment is stir back into the liquid. Spoon this immediately into individual bowl. Pour the milk into the bowl from a height about 12 - 15 cm away so the ginger juice is mixed thoroughly with the milk while pouring. Pour the milk in one go only (very important), do not go back if you have any left over or you may find the curd separates. Cover the bowl with a saucer and let it sit without disturbing. The milk will set in around 3 – 5 minutes. Here is the test if the spoon does not sink you have done it right. Ready to eat straight away warm or cool in the fridge and eat it cold. The curd is quite soft and should be very silky. Do not stir the curd or it will return to liquid milk again. If the milk does not curdle after about 8 minutes as it should be, here is a trick you can try if you have a microwave, put the bowl into the microwave set it at the lowest setting and ping for around 1 minute you should see the milk set. Not sure if ginger will work with soya milk. Many say won't work. I will try and keep you posted. this is such a beautiful discovery. i love ginger, and get a stomach ache from having milk ever since i moved from europe to north america, maybe this will help. I made this on Monday for my Mum. I don't like ginger so won't eat this - I prefer the 'double-skin milk' (雙皮奶). My ginger curd is quite strong in ginger flavour which I like. Saying that I think you have used far too much ginger juice, you should not use chinese soup spoon for measuring. One Chinese soup spoon can be over 2 std tbsp. Try use a std measuring spoon. I will amend the recipe so other people will not make the same mistake again. If you still find 2 std tbsp in too strong try reduce it to 1 1/2 std tbsp, too little may not set. Sugar helps to calm down the fiery taste. Try adding 6tsp (2 rounded tbsp) first time to see if it is too sweet then reduce later to your liking. i found another recipe and found that if there is not enough ginger juice it will not curd so i added more ginger for my other batch and it did set but it tasted too much ginger!! Help!! The more mature the ginger the better it is, ginger juice with a starchy sediment is very good to set the milk. What milk did you use? I find the higher the fat content the easier to set the milk. Also adding milk powder to full cream milk helps. I find over here in UK, using Jersey milk is very easy to set the milk and can use less ginger juice. If you don't like a strong ginger flavour, I would suggest you use rennet to set the milk and add as little as you like for flavour only for setting the milk. Is the milk powder necessary? Will try this soon! Milk powder is to make the milk more concentrated so the curd will be firmer. You can just use full cream milk if you like. Just don't use skimmed milk without powder or the curd will be watery. 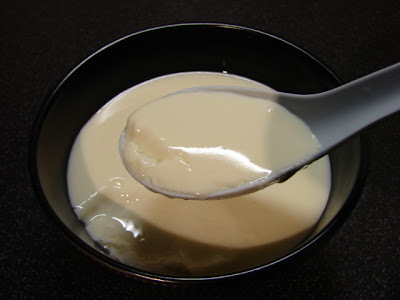 I have found a fool proof way to make this curd using rennin and adding as much or as little ginger juice as preferred. To set with ginger juice the traditional way you will need enough ginger or it will not set, some people says the curd was too spicy.